Vilhelm Hammershøi, Ida Reading a Letter. Oil on canvas, 66 by 59cm., 26 by 23¼in. Estimate: 500,000-700,000 GBP. Sold for: £ 1,721,250. Photo: Sotheby's. LONDON.- A few hours ago, at Sothebys in London, Vilhelm Hammershøis Ida Reading a Letter sold for £ 1,721,250 / Danish Krone 15,747,499 / US$ 2,677,232, surpassing its pre-sale estimate of £500,000-700,000 / Danish Krone 4.57  6.4 million / US$800,000-1,120,000, and establishing a record for the artist at auction and a record for any Danish work of art at auction. The painting was hotly pursued by three bidders on the telephones, before finally selling to an International Private Collector. The price achieved was almost three times above the previous record. Ida Reading a Letter, painted in 1899 (66 by 59cm., 26 by 23¼in. 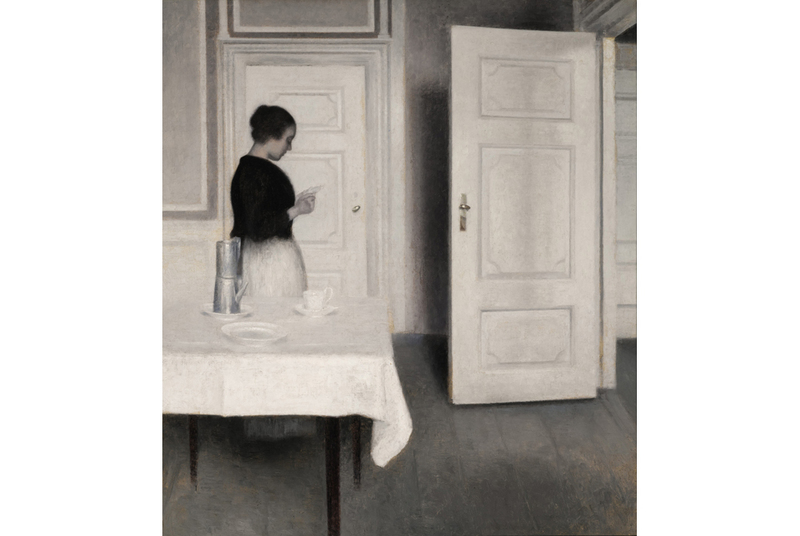 ), was among the first works painted by Hammershøi in the rooms of Strandgade 30, an address that was to play a critical role in the development of the painters singular aesthetic. In his subtle use of light, muted tones and subject, Hammershøi perhaps owes his greatest debt to the Dutch seventeenth-century master Johannes Vermeer and he would have seen Vermeers works first-hand on a trip to Holland in 1887. The composition is remarkably similar to Vermeers Woman Reading a Letter to the extent that it seems impossible Hammershøi did not have this work in mind. The rarefied light is the principal subject here, with nuances that betray the Danish setting.